There are many ways to find cheap above ground swimming pools, and they can be the perfect answer for those with limited budgets. Inexpensive above ground pools can be used pools, the pools found at Wal-Mart or Cosco, they can be soft side pools or inflatable pools. A lot of pools can be set up in your yard and ready to swim for under $1000. Some for as little as three to four hundred. 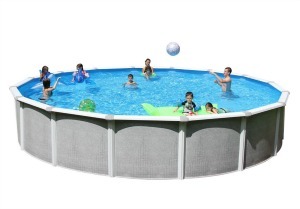 The three biggest reasons for not getting the greatest amount of enjoyment from an above ground pool are small, inadequate filter systems, really thin liners or a lousy installation. The cheaper pools are famous for pumps and filters so small they would have a tough time cleaning a fish aquarium. Some of the liners are so thin you will be lucky to get one season out of them. If these pools are installed several inches off level they can be almost impossible to complete, and if you do, they will probably collapse soon after filling. If the sand base is so rough and lumpy, you trip walking across the pool, cleaning will be impossible. 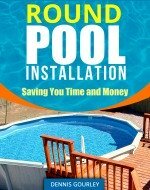 We install a lot of cheap pools where our labor charge is more than the cost of the pool, but still well worth it to our customers who can then enjoy their pool. There are several ways to obtain a cheap above ground swimming pool. Our local newspaper want adds usually have a decent selection of used above ground pools. These can be a great money saving bargain. 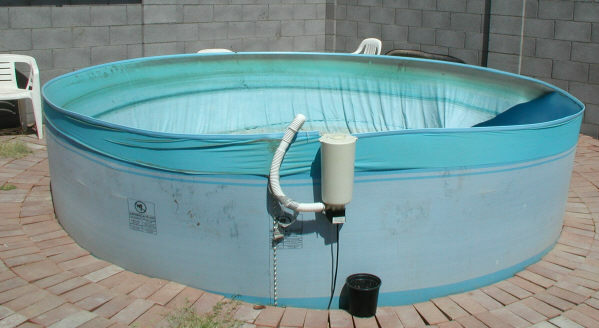 With used pools you will probably get a quality filter and decent ladder. If you are lucky, maybe some cleaning equipment or a pool cleaner. You should always count on buying a new liner, and new coping, to hold the liner in place. Don't let anyone tell you the liner is only a couple years old and should be fine, just plan on a new one. They install much nicer, giving you a better pool right from the start. If you are planning on having it installed, check on the extra charge to take down and transport also. A couple hundred dollars could save you a lot of grieve and back pain. Having the right equipment and knowledge really does help. When looking at used pools, check the bottom rail, footplates and the sidewall. If there are rust holes in the wall, or if the bottom rails and footplates are falling apart, don't buy it. Walmart, Cosco or K-mart are all good places to find low quality, but low cost, above ground swimming pools. Once these are installed it is wise to use a little extra chlorine and run the filter a lot. Run the filter 18 hrs a day, or more, if you have to. These are very small filter systems and need to be run a lot. At this point start saving for a better filter. A good sand or cartridge filter should be you next investment. Next should be a good cleaning kit to go with it, if one did not come with your original package. This amounts to another $400. or so and should probably happen sometime within the first summer. At the start of the second season a good liner should be installed, if your pool requires one, most do not anymore. At this point you may have $800. - $900. invested and you have a pool that can be enjoyed for years to come. The walls and frame components will not last as long as the more expensive above ground pools but you should expect at least five years. Soft side pools and inflatable pools can also be obtained cheaply. Bought new the soft side frame pools can be more expensive than the best steel wall above grounds, but if you can find a used one, it should sell real cheap. Inflatable pools should only be bought new and don't expect them to last too long, but for a summer of cooling off they can be a cheap option.